Send a sweet gift from the orchard. 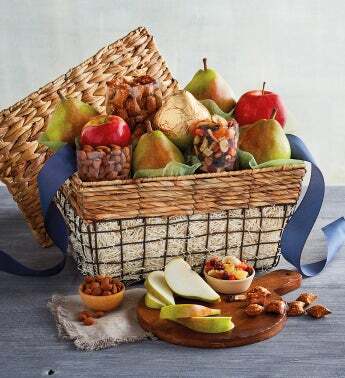 Extraordinarily juicy Royal Verano® Pears, premium apples, and crunchy peanut butter pretzels nestle among other tempting treats in this wholesome and delicious gift. We pack it all in a rustic wire basket with woven details. The basket will come in handy for décor or picnics out in the orchard for years to come.